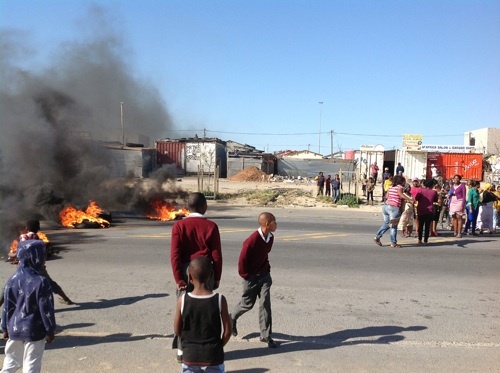 Protest involving burning tyres on Freedom Way in Montague Gardens, sparked by the City’s Anti-Land Invasion Unit’s intention to demolish shacks in Joe Slovo Park, entered their second day today. About 50 residents of Joe Slovo Park, most of them middle-aged women, burnt tyres along Freedom Way during afternoon rush hour on Tuesday, forcing traffic to onto alternative routes. The road, which runs from the Montague Gardens industrial area into Joe Slovo Park, remained closed yesterday morning as the protests continued. Residents say they are angry at the Anti-Land Invasion Unit’s (ALIU) move to demolish six shacks and two church structures illegally built on City-owned land at the corner of Democracy Drive and Freedom Way. The ALIU had marked the structures for demolishing by using yellow paint to write the marking ‘ALIU X with the demolition date of ‘30/10/12’. Nompakamiso Tolashe, 32, who lives in a one-room shack she shares with her two children aged one and eight, said she had spent R6000 on building materials to construct her home, only to now see it marked for demolition. Tolashe said she was at work on Tuesday when she received a call from her younger sister telling her the shack was marked by the ALIU. She said she left work to join the protesting residents in a bid to save her home which had been built two months ago. “If the destroy my shack they (ALIU) must give me another place to stay. I have been on a housing waiting list since 2006. I’m very angry. What if nobody informed me that they were here to demolish our shacks?” said Tolashe. She said today morning police used pepper spray to disperse the protestors confronting the SAPS and ALIU officials who had arrived to carry out the demolition. Community leader Mzamo Mbange said the land in question was initially zoned for low cost flats and a shopping centre and residents were upset by the City’s move to demolish residents’ shacks without consulting the township leadership. One of the church structures set to be demolished belonged to Mkhombe Ka Nowa Church which had a following of more than 50 people, said community leader and church member Nothemba Ntoyake. Ntoyake said if the church structure was demolished her congregation would have no place to worship. If the City went ahead and demolished the church structure, it showed they had “no respect” for religion, she said. “If they demolish our church they should provide us another place to worship God,” said Ntoyake. ALIU Head Stephen Hayward confirmed that his Unit had marked six structures for demolition as they were illegally built on City-owned land. Hayward said they had served notice on the occupants and yesterday was the demolition deadline but they would wait for further instructions from “our politicians”.